Funnily enough it turns out our Christmas was all about making and construction toys. The kids have enjoyed making and playing with all the different kits they got for Christmas this year. I thought it would be interesting to share what we got and how they compare with each other. 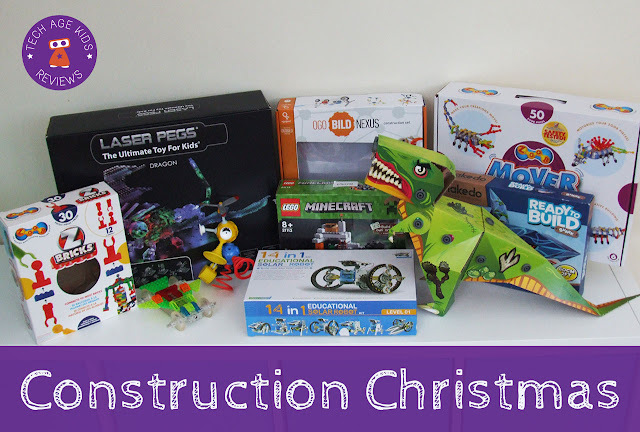 Under our tree we got, Laser Pegs, Minecraft LEGO, Ogo Bild, Zoobs, MakeDo Kits, Nanoblocks, Simbrix and a Solar Robot Kit. Read what we thought of our construction kits and what age enjoyed them the most. My 5 and 7 year old got the Shark and T-Rex Ready to Build Sets and absolutely loved them. They were easy enough for my younger child to build with some adult help. The cardboard is your typical box type cardboard, but it is the screws and tools that we were impressed with. Cardboard is not the most durable material as a toy, but the tools and screws can be reused. Laser pegs are great LEGO-type bricks that use LEDs and circuits to light up the model. We got the Dragon kit which comes with a storage box and the lid of the box is the battery base upon which you build your light-up model. We also got another small vehicle set, where the battery base is a lot smaller and when you add the wheels you can push it around. The bricks are transparent to allow the light to disperse through the model.The light settings vary between staying on and flashing. We found the bricks quite stiff to connect, but it does mean it stays together. The instruction booklet shows only one model, but you can download other models for your kit from Laser Pegs online. Laser pegs are compatible with LEGO bricks and there is a big range of kits available. My kids are huge LEGO and Minecraft fans, so it was inevitable for us to own a Minecraft LEGO kit. My 5 year old built this kit without any assistance and then played out a Minecraft game with his set. They are now keen to expand their collection. The construction set allows you to easily move the "Minecraft" blocks around whilst you play and the mini figures are brilliant. I certainly know what we will be getting with birthday gifts next year. The solar construction kits are brilliant. My 7 year old son received a similar solar kit for his birthday in the summer. The instructions are easy to follow and he just needed some help to cut the pieces out. With 14 different robots to build we have not yet scratched the surface of this kit. The best part is you don't need batteries, however it can be frustrating when there is no sun and a bright enough light to test your creation. We've not owned Ogo Bild sets before and so I was very curious how they worked and what their quality was like. 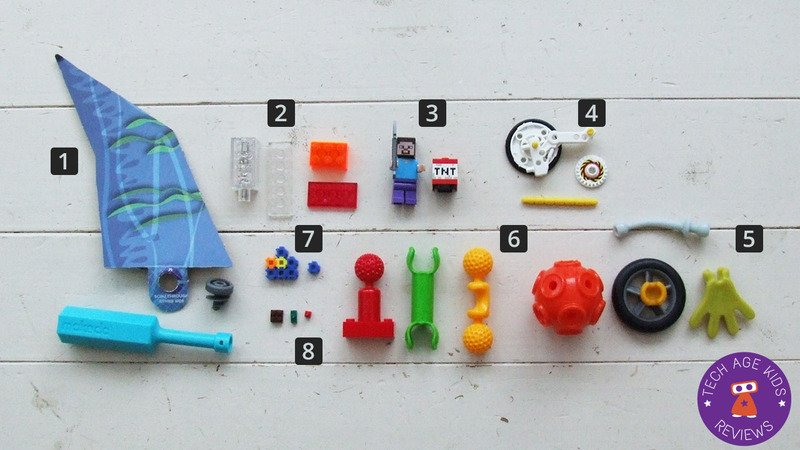 I was suitably impressed with the quality of the plastic pieces and the variety of bits included. The box came with no instructions, which seemed a bit strange, but then there is really no limit to what you can create with the set. My youngest commented, they were his crazy creature set. There's a reusable sticker set in the box to add character to your creations. Ogo Bild have any sets and looks like a good kit to build up over time. They are fun and easy to build and would make a perfect construction kit for younger kids. We've had a Zoob Contruction set for a while and my kids love playing with them, creating their own vehicles and creatures. They can be a bit tricky for younger kids to build, as you need to click them into place and we've had a few tears when fingers get caught. This year we got some Z Bricks and a motorised bug to add to our collection. The Z Bricks allow you to connect Zoobs with LEGO. The connection is secure enough and opens up more building opportunities with the Zoob bits. The motorised bug works as an RC toy, which you can build your Zoob creature on. The bug walks rather than having wheels, so it makes a fun moving creature which the kids enjoyed building and moving around the floor. Simbrix are fantastic building blocks to create 2D pixel art and pictures. The bricks are small and require a fair amount of dexterity, but once my 5 year old got the hang of building them, he is used them without any adult help. If you liked LEGO as a child, you will enjoy Nanoblocks. They are tiny LEGO-type bricks which you construct into buildings or models. We got the Sagrada Familia set, one of their famous buildings range, for our teenager. He thought they were brilliant, although we did find the instructions somewhat confusing. The bricks are micro and so we'd not recommend it for young kids. My son, now wants to add other famous buildings to his collection. Did you get construction or making kits for Christmas? Which ones did you like best?